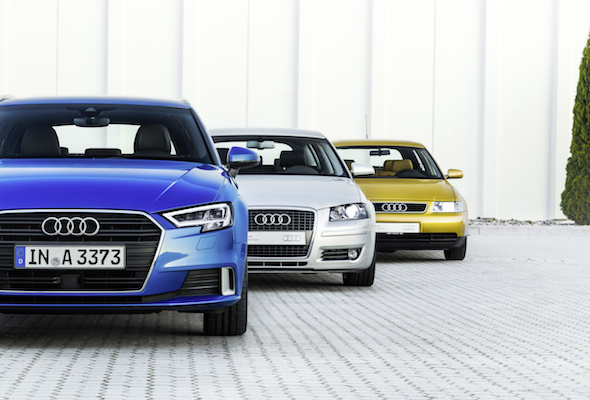 Audi is celebrating as its popular A3 model hits 20. The successful hatchback has seen more than 500,000 UK, and four million worldwide sales over three generations, since it was introduced at the 1996 Frankfurt Motor Show. Prior to its debut, the model had been developed from the ground up on the basis of the Golf IV platform, which entered the market the following year. Dubbed the 'founder of the premium compact' the original A3 featured innovations and quality features usually only seen in higher model classes. This first generation model was initially available only in a three-door hatchback – five doors followed in 1999 – with the option of three trim lines and four different petrol and diesel engines. Two years later, the addition of Quattro brought permanent all-wheel drive to the compact segment for the first time. And in 1999 the high-performance S3 joined the A3's ranks, boasting a 207bhp turbocharged inline-four engine. The second generation A3 made its debut at the 2003 Geneva Motor Show, having been developed by the renowned designer Walter de'Silva, and based on a brand new platform. The A3 is now in its third incarnation, and for the first time can be specified as a saloon. The RS 3 Sportback sits at the top of the model line-up. Introduced in 2011, it featured a 335bhp, five-cylinder engine, with a 362bhp second edition following in 2015. This Sportback now looks to be surpassed by the RS 3 Saloon, a 2.5 TFSI engine with 395bhp, which was unveiled at this year's Paris Motor Show.